Electoral returns in states holding state elections in late summer and early autumn were considered a reliable predictor of how the states would vote in the early November presidential election. 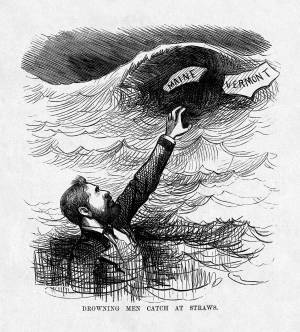 Although Republicans were scoring victories in those states in 1872, this Matt Morgan cartoon presents as a delusion President Ulysses S. Grant’s expectation that success in the Maine and Vermont state elections will bode well for his reelection. It was, however, Morgan who was grasping at straws. Grant easily carried both states in his landslide victory that November.